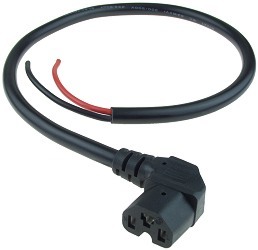 Browse for power cords by vehicle make and model. Multi-fit plug works with outlets that have 2 vertical and 1 horizontal pins, and also with outlets that have 3 vertical pins. Two 14 gauge copper wires (red and black). 23" overall length.